In October, analysts at the Ostrogorski Centre discussed Belarus’s involvement in supplying arms to Syrian war parties, the UK’s new approach towards Belarus, and how President Alexander Lukashenka’s recent appointments strengthen Belarusian independence and identity. Commentary from the Ostrogorski Centre also appeared in the media. The topics under analysis ranged from the new edition of the law on mass rallies, to the Belarusian anarchist movement and state reactions against it, and to Belarus-Azerbaijan deals on weapons and oil. Last but not least, the centre published five new policy papers in the areas of economics, education and public administration, and uploaded them to the BelarusPolicy research database—a joint project between the Ostrogorski Centre and the Belarusian Research Council. Siarhei Bohdan examines on whose side Belarus is in the Syrian civil war. Belarus thus is accused of supplying all sides in the Syrian civil war. If the allegations are proven, unscrupulous deals in such a conflict amount to a gross violation of international security regulations. The responses by more influential states or a global power like the US or Russia to such a violation would likely be much harsher than their reactions to human rights violations committed by Minsk. But available evidence proves that Minsk is only an indirect participant. Its involvement in the Syrian conflict as a supplier of weapons is limited to working with intermediaries acting on behalf of Western countries and their allies. Igar Gubarevich investigates whether the United Kingdom is finally interested in Belarus. The UK has virtually overlooked Belarus since the latter regained its independence over twenty five years ago. London has, by and large, been a strong proponent of a hard-line approach towards Lukashenka’s regime. The UK has avoided talking to the authorities in Minsk. The UK’s post-Brexit needs and Belarus’s increased role in stabilising security in the region made the junior minister’s visit to Minsk finally possible. However, a major increase in bilateral cooperation or the UK’s substantial departure from today’s common EU policy towards Belarus remains unlikely under current circumstances. Vadzim Smok claims that Lukashenka’s recent appointments strengthen Belarusian independence and identity. Over the last few months, the Belarusian president has made a number of high-level appointments that demonstrate a clear trend of “Belarusianisation” of the government. A number of new military chiefs never studied in Russian military schools as did most of their peers. Certain job candidates known to speak Belarusian on a daily basis received positions as rector of Lukashenka’s alma mater – Mahilioŭ State University, Minister of Information and Deputy Foreign Minister. This policy is apparently supposed to strengthen the country’s independence and national identity. What differs “Belarusianisation” from Lukashenka’s previous policy methods is to emphasise not a purely statist, but also a cultural approach to nation-building. On Radio Poland’s “Political mirror” programme, Ryhor Astapenia discussed the entrance of private companies to the utility sector, whether the authorities will allow Belarusians to rally freely, and why only a few hundred people gathered at the socio-economic protest in Minsk. Igar Gubarevich, also on Radio Poland, analysed the first visit of a high-level British official to Belarus in the country’s independent history. According to the expert, the visit of Sir Alan Duncan has two obvious reasons. First, the UK is interested in Belarus’s position on the annexation of the Crimea remaining unchanged. The second reason is Whitehall has begun to negotiate Brexit and it is looking to shape its own foreign policy independent from the EU. Therefore, the official explored how to build Britain’s own policy towards Belarus. The third Ostrogorski Centre analyst to speak on Radio Poland, Alesia Rudnik, discussed today’s anarchist movement in Belarus and its persecution by the authorities. The Times of Israel newspaper quoted Siarhei Bohdan in an article on Belarus’s possible military assistance to the Syrian Assad regime. 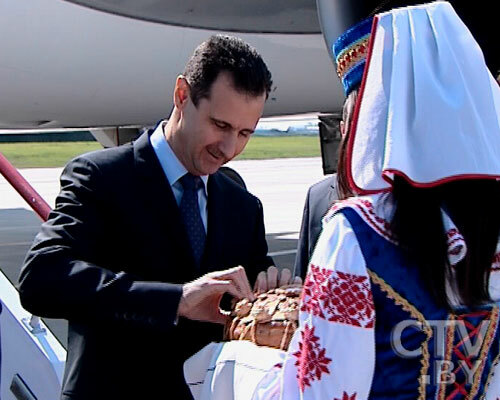 According to Siarhei, Belarus’s ties to the Assad regime are not as deep as they appear. The country is still looking to maintain its business ties with the Gulf states—which have deeper pockets than Syria—and that Belarus would not risk those relationships for a quick buck from Assad or Iran. Siarhei Bohdan in an interview to Azerbaijani news agency Vzglyad.az discussed the meeting of Belarusian Security Council State Secretary Stanislaŭ Zaś with Azerbaijani President Ilham Aliyev. According to Siarhei, Zaś was likely to have negotiated on Azeri oil supplies to Belarus, as well as defence industry projects, in particular, involvement in Belarus’s missile programme. Aliaksandr Filipaŭ. Mechanisms of motivation of civil servants in Belarus: how to reconcile the irreconcilable? BIPART, 2017. Aliaksandr Čubryk. Reforms in Belarus after the cancelled IMF program: totem and taboo. IPM Research Centre, 2017. Kaciaryna Barnukova. Fiscal redistribution in Belarus: what works and what doesn’t? BEROC, 2017. Final monitoring of the implementation of the Roadmap for Higher Education Reform in Belarus. Belarusian Independent Bologna Committee, 2017. Belarusian Economic Review, Q2 2017. BEROC, 2017. Think tanks in Belarus are encouraged to submit their research for inclusion in the database by emailing us. On 7 September, the Israeli air force attacked the Syrian military’s Scientific Studies and Research Centre. According to the Times of Israel, Belarusians may have been among those working at the Centre. Meanwhile, a Bulgarian hacker group recently published documents showing that Silk Way, an Azerbaijani airline that transports arms for Syrian opposition groups, directed some of its flights via Minsk. Concurrently, Russian and Polish media circulated reports of alleged arms deals between Minsk and sponsors of Syrian opposition groups for several millions euros. Belarus thus is accused of supplying all sides in the Syrian civil war. But available evidence proves that Minsk is an indirect participant. Its involvement in the Syrian conflict as supplier of weapons is limited to working with intermediaries acting on behalf of Western countries and their allies. On 15 September, the Times of Israel published an article about alleged defence cooperation between the Belarusian and Syrian governments. It quoted Ronen Solomon, an Israeli freelance intelligence analyst, saying there were Belarusians working at the Syrian military’s Scientific Studies and Research Center helping Damascus to improve its ballistic missiles. However, the Syrian opposition website Zaman al-Wasl reported it was Russians, Iranians and North Koreans, who had worked at the bombed facility. Solomon told Times of Israel “that given the nature of the site and Russia’s interests in the region, it’s unlikely that Moscow would send experts to such a facility,” hence they should have been Belarusians. Belarus, however, has little to offer to Damascus in terms of missile technologies. and that little technology it itself acquired in the most recent years. Minsk inherited a great deal of military technologies from the Soviet Union, but has next to nothing to build missiles. In the early 2010s, it even had to ask the Chinese, and maybe also recruited some Ukrainians, to help assemble multiple–launch rocket systems. These types of systems are the most basic for a country intending to master missile technologies. Although this year Belarusian defence companies demonstrated something similar to short-range cruise or ballistic missile at a defence industry exhibition in Minsk, these are not the types of technologies that interest either Syria or its Iranian allies. Moreover, even if Belarus had something to offer the Syrian government, that would be a doubtful deal for Belarus. Minsk knows these sorts of deals would hardly bring money from an embattled leader such as Assad. It would also undermine Belarusian relations with Assad’s opponents, particularly rich, Arab, conservative regimes. In 2012, The Atlantic, a respectable US media outlet, reported that Minsk might be trying to help Syria build fibre-optic gyroscopes for surface-to-surface missiles. No proof has ever been publicly presented. Nonetheless, since 2012, the US Treasury has maintained sanctions on the Belarusian defence firm Belvneshpromservice (BVPS). The sanctions have been imposed for violating the Iran, North Korea, and Syria Nonproliferation Act, which forbids supplying these states with any materials and equipment related to weapons of mass destruction or cruise or ballistic missiles. It is not clear what triggered the imposition of US sanctions. Back in 2012, the media reported that the sanctions had been imposed for Minsk providing Syria with “fuses for general purpose aerial bombs.” But, in fact, it could have been for a deal with any of the three black-listed countries. Indeed, during that period Minsk is documented to have supplied radars to Iran. Arms for Syrian opposition: How much did Minsk know? The EADaily article was not the first report about Belarusian arms reaching Syrian opposition via the Balkans. As early as September 2015, American media outlet Buzzfeed revealed that a US contractor via a Bulgarian intermediary had bought 700 missiles for “Konkurs” anti-tank systems from Belarus. Moreover, the Buzzfeed article alleged that American instructors sent to teach Syrian opposition fighters how to use the systems had passed through Belarus en route to Syria. This may just be the tip of the iceberg. In an official report, the Bulgarian Economics Ministry catalogued €37.8m in arms imports from Belarus to Bulgaria for 2015. In 2016, Belarusian arms imports rose to €84.2m. Most of these deliveries were sent via Romania. This ensured the arms were subject to customs declaration. Therefore, according to official Romanian Foreign Ministry reports, Belarusian military exports to Bulgaria via Romania in 2015 not only included smoothbore arms with a calibre of more than 20mm, but also various arms with a calibre more than 12.7mm, and ammunition, missiles, artillery shells, and bombs. In 2016, the Romanian Foreign Ministry tracked imports of missile systems, artillery shells with a calibre of more than 122mm, RPG grenades, missiles, an armoured vehicle, and aircraft-cannon shells. These shipments stand out, because before 2015 Belarus scarcely exported arms to Bulgaria. For instance, according to the Bulgarian Economics Ministry, in 2013 Bulgaria imported missiles, artillery shells and military electronic equipment from Belarus worth €411,000. Of course, these accusatory reports are shtum about the final destination of the Belarusian arms. Bulgaria has no need for these weapons. Russian EADaily, furthermore, noticed that the exports from Belarus to Bulgaria coincide with the value of official Bulgarian exports of similar arms in similar quantities to the US and Saudi Arabia. It is most likely that the Belarusian arms went to the Syrian opposition. Oddly enough, Bulgaria itself manufactures almost all the types of equipment and ammunition that it bought from Minsk. Such deals, however, make perfect sense, because Minsk still has these items left over from Soviet times. Such arms, if sent to Syria, would not attract much attention in a country that for many decades had bought Soviet arms. 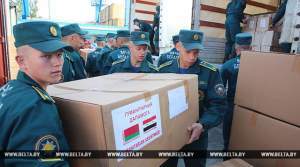 Delivery of Belarus humanitarian aid to Syria in summer 2017. Image: BelTA. Nonetheless, the situation is even more complicated. The arms might have gone from Bulgaria to various destinations outside Syria, as well. Hackers from the group Anonymous Bulgaria have recently published stolen documents from Azerbaijani airline company Silk Way. 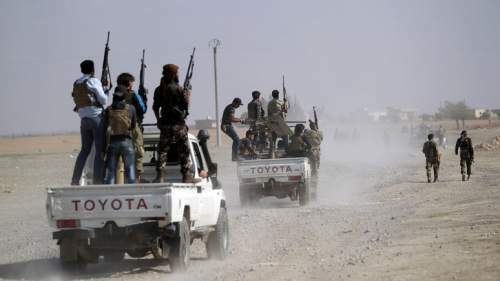 The documents appear to show the company has been transporting arms for the Syrian opposition. The documents also indicate Silk Way had flights originating from Minsk, but not heading for the Middle East. On 14 February, the company reportedly transported ammunition from Minsk via Bulgaria to Afghanistan. In sum, Western and Russian media regularly speculate on Belarus’s alleged ties to various parties in the Syrian civil war. The secretive and relatively unknown Belarusian regime naturally attracts such accusations. In particular, this sort of speculation provides explanations for otherwise murky cases, like that of the Syrian missile centre. In addition, accusations for alleged Belarusian assistance to either the Syrian government or to the opposition can be used as a political tool against Minsk. If the allegations are proven, unscrupulous deals in such a conflict amount to a gross violation of international security regulations.The responses by more influential states or a global power like the US or Russia to such a violation would likely be much harsher than their reactions to human rights violations committed by Minsk.